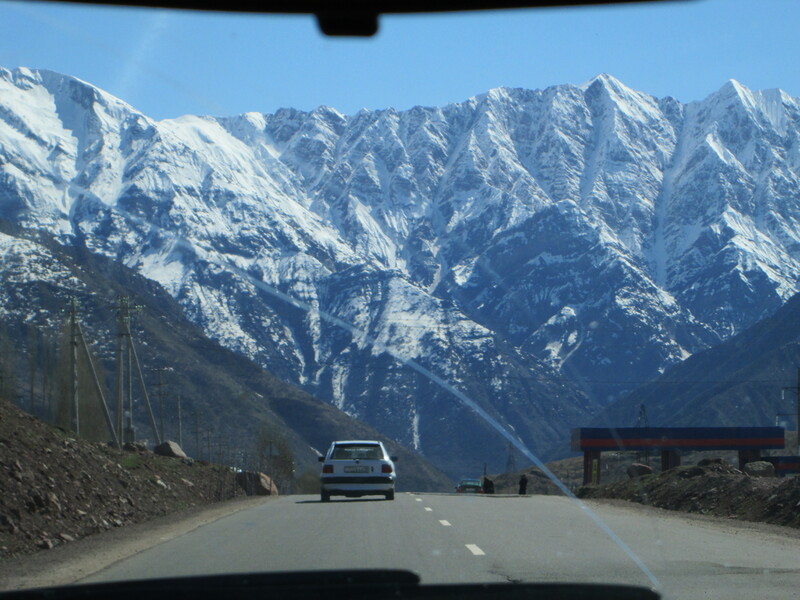 Last week your blogger enjoyed a retreat from the heat of Dushanbe (where it is now threatening to approach 40 degrees on a daily basis) to the town of Romit, about an hour’s drive northeast into the Fan Mountains. The purpose was to attend a Mid-Term Review of the United Nation Development Programme (UNDP)’s Tajikistan Mine Action Strategic Program (TMASP) 2010-2015. Basically, a 3-day summit of all the main actors involved in landmine related issues (land release, victim assistance, mine risk education, advocacy, etc. ), to assess progress made, and to update the strategic plan to address challenges for the future. As a representative of Norwegian People’s Aid (which is involved almost exclusively in land release, aka demining), my role in the conference was marginal but a good opportunity to learn and network with interesting people. 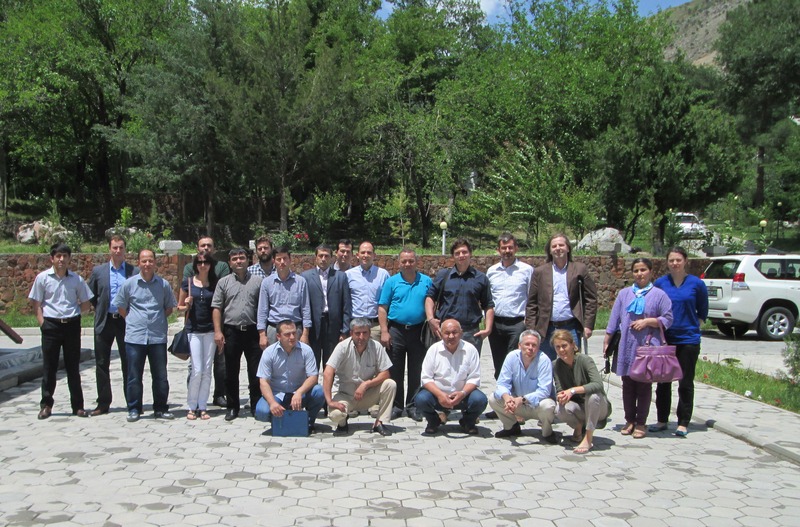 When the participants were split up into different Working Groups to focus on specific elements of the TMASP, I joined the group on transferring ownership of the mine action program from the UNDP to the Government of Tajikistan. Along with representatives of other international organizations (OSCE, GICHD, FSD), my group included members of the Tajik Ministry of Defense, National Guard, Border Forces, and the Union of Sappers of Tajikistan (UST). As expected, progress on reviewing and updating the TMASP was painful and slow for our group. 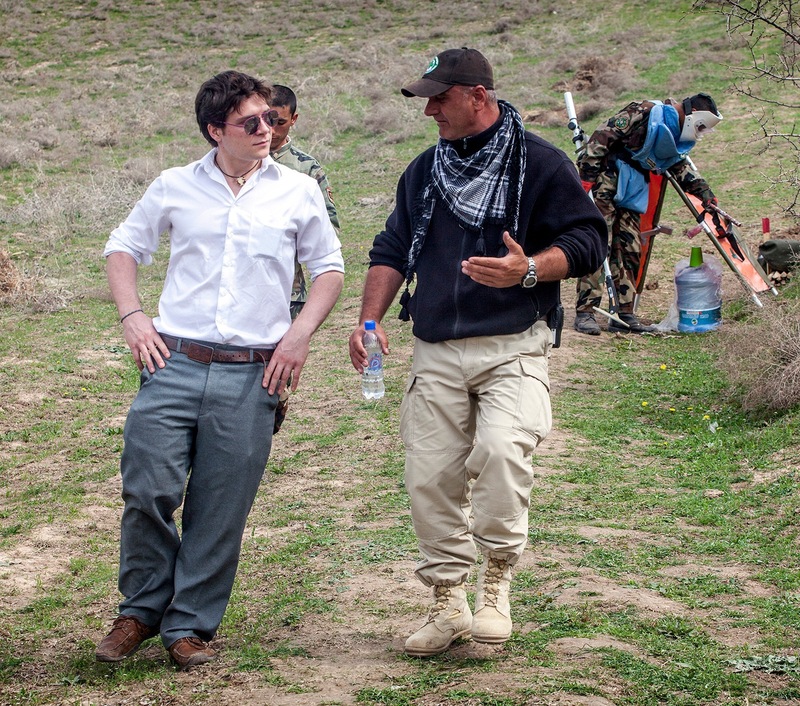 Frankly, it was difficult to arrive at consensus on even the most basic definitions – for instance, what does it mean for the Tajikistan Mine Action Centre (TMAC) to be established as a “legal entity”? Technically TMAC is already “legal” in the sense that its existence is authorized by an MoU between UNDP and the Tajik Government, yet it remains in an institutional grey-zone because it is not under the formal authority of any specific Ministry. To add to the confusion, slight differences of wording can translate into entirely different meanings between English, Russian, and Tajik. So, what interesting things did I learn after three days of power-point slideshows, plenary discussions, working group meetings, and informal dinner conversations? 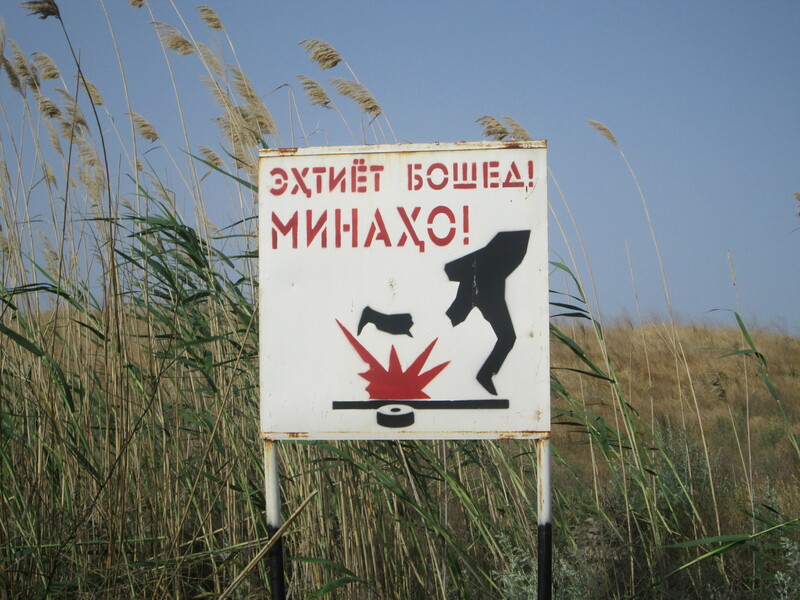 Perhaps the most striking lesson for me was the realization of how differently the problem of landmines in Tajikistan is viewed by local civil society / international organizations on the one hand, and national military authorities on the other. The reality is that segments of the Tajik armed forces continue to view anti-personnel landmines as having positive strategic functions. In this mindset, the removal of mines on the Afghan border actually constitutes a reduction in border security. Of course, representatives of humanitarian demining organizations (including my director) took pains to argue that this was emphatically not the case, and that in fact the opposite is true (more often than not, anti-personnel landmines end up killing and maiming a country’s own citizens rather than enemy combatants). Why is it the case that these military officers expressed such skepticism about the goals of landmine removal and land release? Very likely it is largely to do with Tajikistan’s close ties with Russia (where many Tajik officers are educated and trained), which continues to insist on the military utility of antipersonnel mines and refuses to sign the Mine Ban Treaty. The influence of this type of “security” thinking is disturbing and should be taken seriously, particularly as Russia muses about retaking control of the Afghan border after the withdrawal of coalition forces in 2014. What this would mean for future mine action operations in Tajikistan – or even the prospect of more landmines going into the ground – is anybody’s guess. Another noticeable theme to the talks, related to the point above, was the growing concern in Tajikistan about the security situation south of the border next year. When discussion turned to the impacts of international troops and aid organizations leaving Afghanistan, there was a noticeable level of anxiety and concern among Tajiks, civilian and military alike. Among the worst-case scenarios on everybody’s mind was the threat of a strengthened Islamic Movement of Uzbekistan (IMU), possibly allied with the Taliban or other armed groups, enjoying free movement across the Central Asian region. Western military leaders and politicans may prefer to paint a rosier picture of Afghanistan’s future, but people living in the region are clearly more worried. Finally, the conference participants were reminded that even though antipersonnel landmines may have no current humanitarian impact, that does not necessarily mean there will be none in the future. The NPA country director gave a powerful example of the minefields along the Syrian-Jordanian border. Like the Tajik-Afghan border, this was considered a low-impact minefield located in a military-controlled border zone with only a small risk of civilian harm. Nevertheless, over the course of several years demining operators such as NPA worked to remove these mines in order to fulfill Jordan’s obligations as a signatory to the Ottawa Convention. Although there was little demonstrable benefit at the time, this work has ultimately turned out to have saved potentially hundreds of civilian lives as massive flows of Syrian refugees crossed into Jordan since the beginning of the Syrian uprising in 2011. 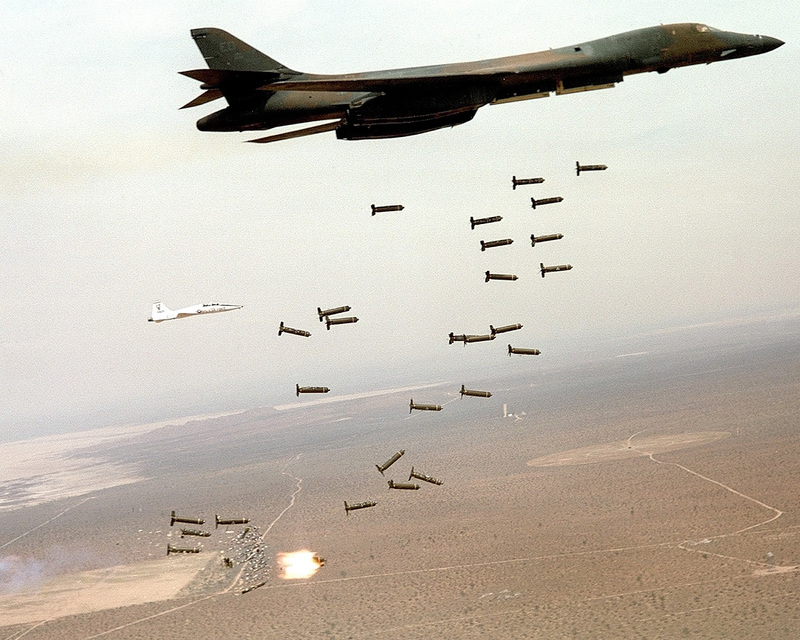 This tale serves as a reminder that even so-called “low risk” minefields can become much more hazardous under future circumstances, and the sooner they are removed the better. That’s it for this week’s post. Thanks for reading and stay tuned. Some participants at the TMASP 2010-2015 Mid Term Review conference in Romit. Read here for my take. I think the short answer is no, you don’t necessarily need it, but the job market is extraordinarily competitive and it does confer alot of advantages for career mobility. At the same time, it comes with considerable costs and trade-offs you should think seriously about. What do other people think? Seriously, I’m curious to know. On another note, I’m heading down to the Afghan-Tajik border today to (finally) visit NPA’s operations at the minefield sites. When I get back later in the week I’ll write a post about it, which (I promise) will return this blog to the subject matter of my work here. 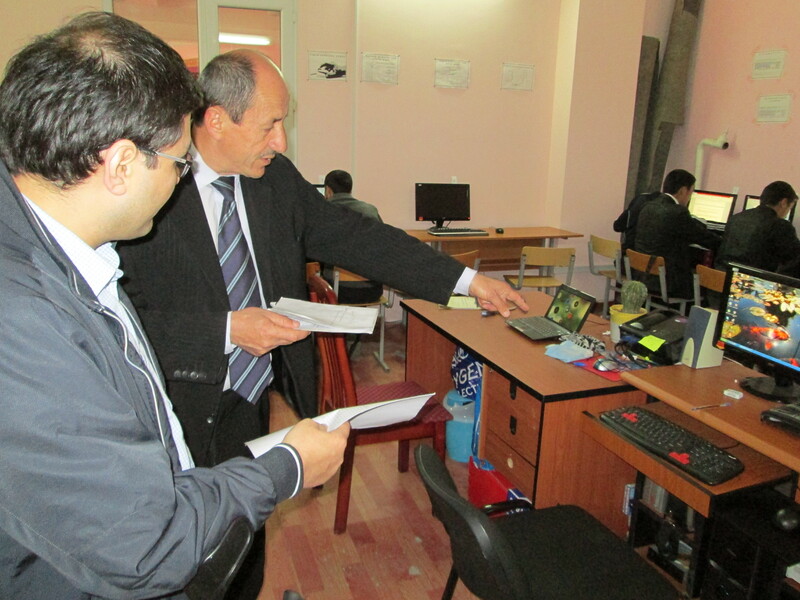 This last week has been a busy one here at NPA Tajikistan. After a long series of delays, the paperwork has finally come through from the necessary government Ministries to deploy over 60 deminers to the Afghan-Tajik border area to begin the 2013 clearance operations. 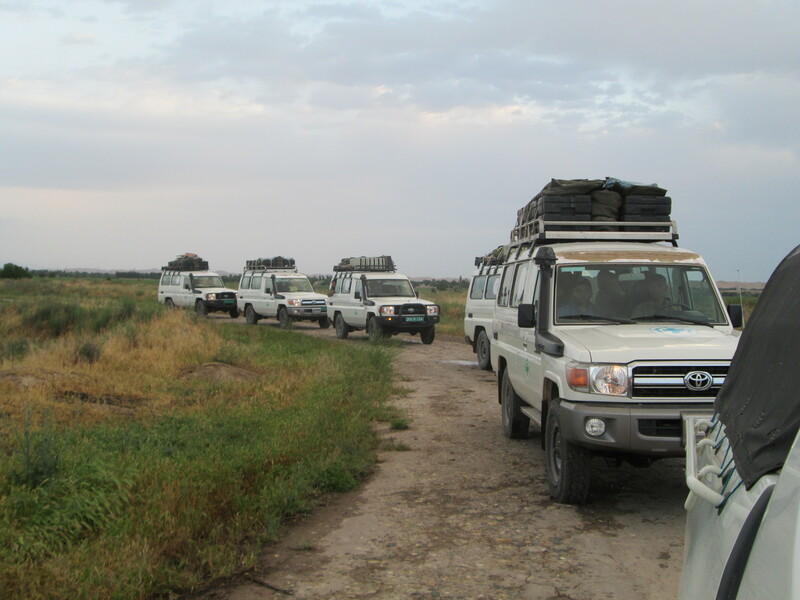 Once the personnel are deployed and the logistics are finalized, headquarters staff are looking forward to a period of “normalization,” as everyone settles into their routine tasks for the demining season. As some readers will be aware, Thursday April 4th was the International Day for Mine Awareness and Assistance in Mine Action. Like other mine action organizations all over the world, NPA participated in a special event to raise awareness about landmine and cluster munitions issues, and to highlight the impact of their work at the national level. In Dushanbe, the Tajikistan Mine Action Centre (TMAC) and Tajikistan Coalition to Ban Landmines (TCBL) held a public exhibition event at the downtown Amphitheatre, where all major mine action organizations showcased their activities. 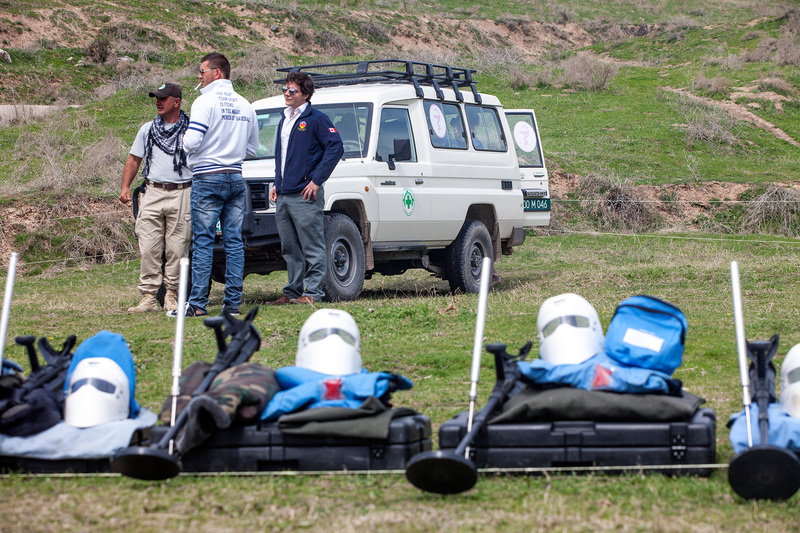 NPA, for example, provided a demonstration of humanitarian manual demining equipment and techniques. The exhibition included speeches from the Tajik Minister of Justice, the head of the OSCE and ICRC in Tajikistan, and ICBL Ambassador Firoz Ali (check out the photos here: https://www.facebook.com/#!/pages/NPA-Tajikistan/237973266241075). 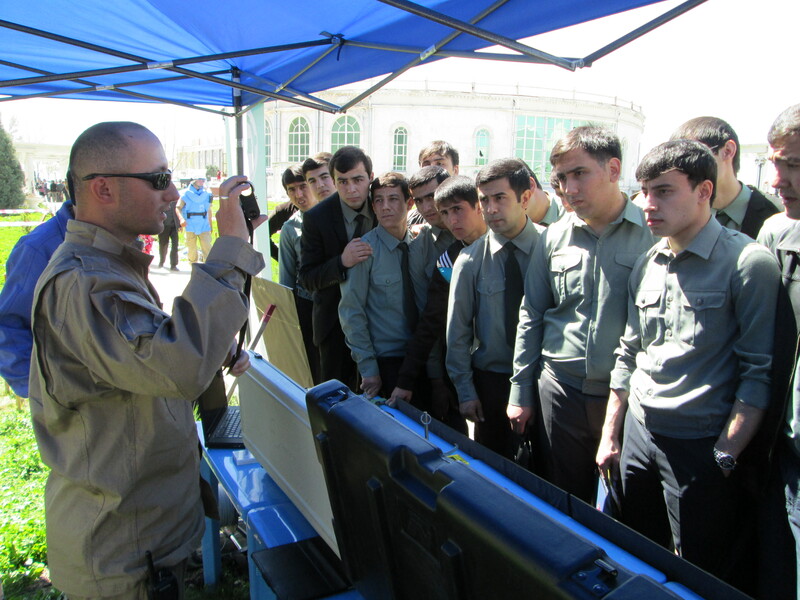 An NPA team leader demonstrates a range-finder to a group of Tajik students. Now, for the main story of this post. Earlier in the week, I also had a unique opportunity to visit a vocational training center for landmine survivors and their family members in the town of Garm, several hours to the east of Dushanbe in the Rasht Valley. As a primary base of anti-government forces during the Tajik civil war, the population and infrastructure of the central region in Tajikistan remain heavily affected by conflict, including landmines and cluster munitions. By some accounts, nearly 10% of the region’s population suffers some form of disability as a result of the conflict and the left-over contamination of unexploded ordnances (an approximation, of course – statistical data is notoriously unreliable, especially in Tajikistan’s remote regions). Even today, the Rasht Valley remains a restive area only loosely under the control of the central government. In 2010, for example, an unknown rebel group ambushed a Tajik military convoy in the village of Kharamog, killing 28 soldiers. 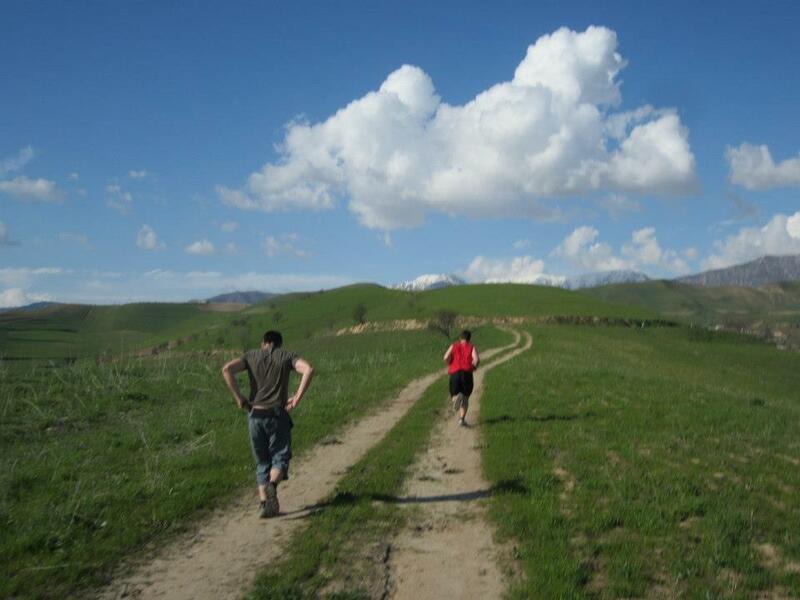 On the road to Garm in the Rasht Valley. Sort of reminds me of “The Wall” from Game of Thrones. 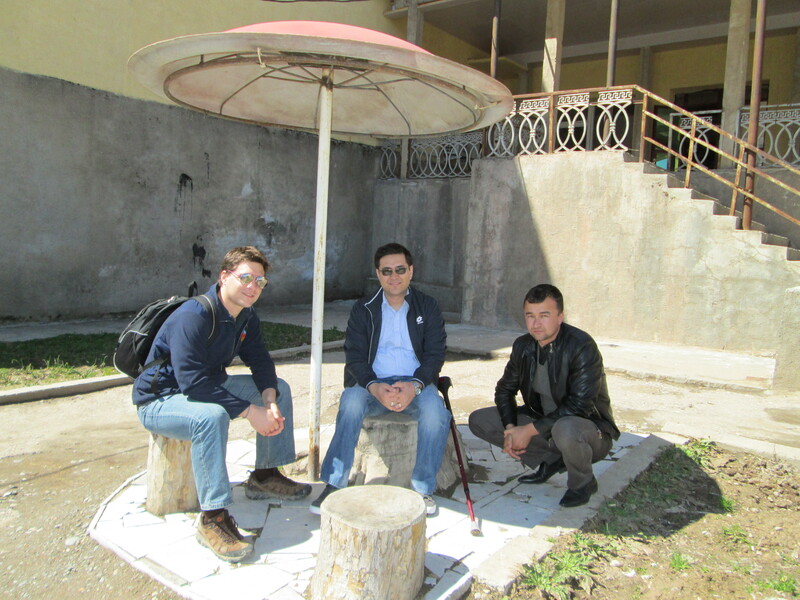 I set out with TCBL campaigner Umarbek Pulodov (at whose family home we stayed and enjoyed excellent traditional Tajik hospitality) and Firoz, who were travelling to Rasht to monitor the progress of the victim assistance program funded by a small grant from the ICBL since 2012. Previously established as a government-run employment training center, the grant has funded a special income-generating program for landmine survivors and their family members. The need for vocational skills-training in affected communities such as the Rasht Valley is obvious; not only does it help build income-generating skills for its participants, but also provides a venue for networking among landmine-affected individuals and an opportunity for victim assistance organizations like TCBL to identify target beneficiaries for other programs such as psycho-social services and peer support. This last point is especially relevant in the conservative cultural environment of Tajikistan’s central region, where the social stigmatization and isolation of those with disabilities (particularly among women) is a major barrier to the provision of services. 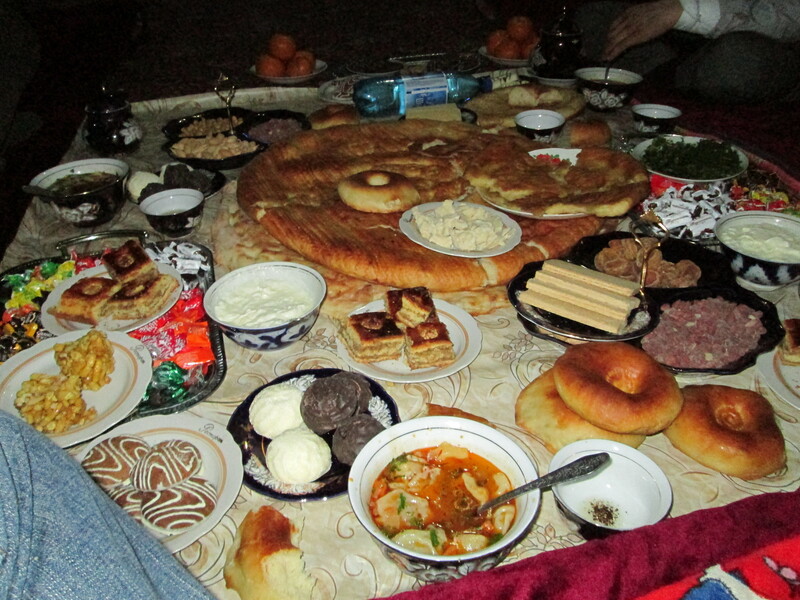 A hopelessly oversized Tajik spread in Umarbek’s home in Rasht. The ICBL supported program includes a three month computer skills course (teaching Word, Excel, and basic hardware maintenance), as well as training in tailoring, baking, and handicrafts. One graduate we met had landed a job doing communications work for a local company – a considerable success story and career opportunity in such an economically underdeveloped region. During an interview with Firoz, the center’s Director claimed that 75% of last year’s graduates now successfully ran some form of small business to provide supplemental incomes. The Director also posed the idea of opening a gift shop on the premises in order to better market the products, as well as construction plans to expand the center (necessitating, of course, additional donor funding). 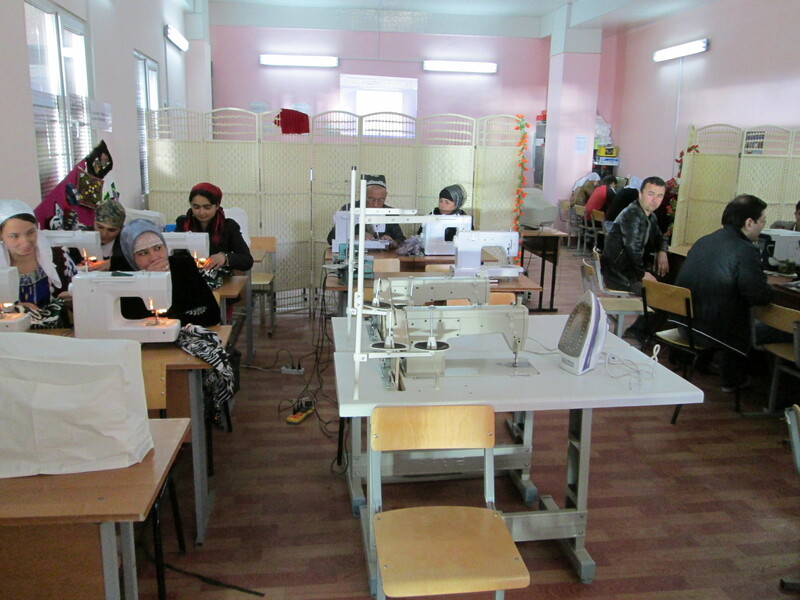 Inside the center, an ICBL-supported vocational training course. The Director explains the computer training course to Firoz. When Firoz asked the Director to explain the fact that all the students actually inside the center during our visit were not directly-affected survivors but only family members, we heard that many disabled survivors had moved away from the region – to Dushanbe or elsewhere – because of accessibility barriers, sometimes leaving their families behind and economically disadvantaged. Alternatively, it was implied that some survivors simply “cannot be helped,” due to either lack of accessibility or an unwillingness on their part to participate in victim assistance programs. We also noticed that none of the students in the computer course were females – this, we were told, was due to the fact that women preferred those skills they could use from the home, i.e. tailoring and handicrafts. So, what did this trip teach me about victim assistance in mine action? First, as Firoz pointed out, raising awareness about the rights of disabled survivors – not just their need for assistance – is critical, particularly for those living in isolation (and, again, even more so for women). The simple fact that landmine survivors themselves in the region were unable or unwilling to directly participate in the vocational training program is a significant shortcoming. Even the training center was not fully accessible, a fact that in itself reflected a lack of prioritization of the rights of the disabled. Second, the absence of female participants in the computer course was also instructive of the deeply entrenched gender norms in this conservative culture, which plainly limit the economic and social options available to affected women in the region. Although these kinds of gender barriers can appear insurmountable, we should remember that they are nowhere permanent. Just look at neighboring Afghanistan; a dozen years ago conditions for women in that country were if anything worse than in Tajikistan. Now, although hardly perfect, access to education for women in many regions is commonplace. Cultures change, if only unevenly and in fits. Myself, ICBL Ambassador Firoz Ali, and our driver Iman. Welcome! You’ve found the site of my new humble blog, following my overseas placement with Norwegian People’s Aid (NPA) in Dushanbe, Tajikistan. NPA is one of the world’s main actors in the campaign to band landmines and cluster munitions, active in landmine clearance, capacity-building, and advocacy work in many landmine-affected countries. In Tajikistan, which suffered a destructive but little known civil war in the 1990s, NPA has been operating a demining program since 2010. Most of this demining work is conducted in the southern region of the country along the Afghan-Tajik border, where Russian military forces laid thousands of landmines in the 1990s to prevent cross-border movement of various rebel groups. Upon arriving in Tajikistan, physically and mentally discomfited by back-to-back red-eye flights, I was greeted in post-Soviet bureaucratic fashion – waiting for three and a half hours for my visa along with thirty or so other expats in an inexplicably small consular services waiting room. Patience prevailed, and I was soon reunited with my luggage and greeted by the NPA driver, Bahktiyor, who took me to my apartment downtown. 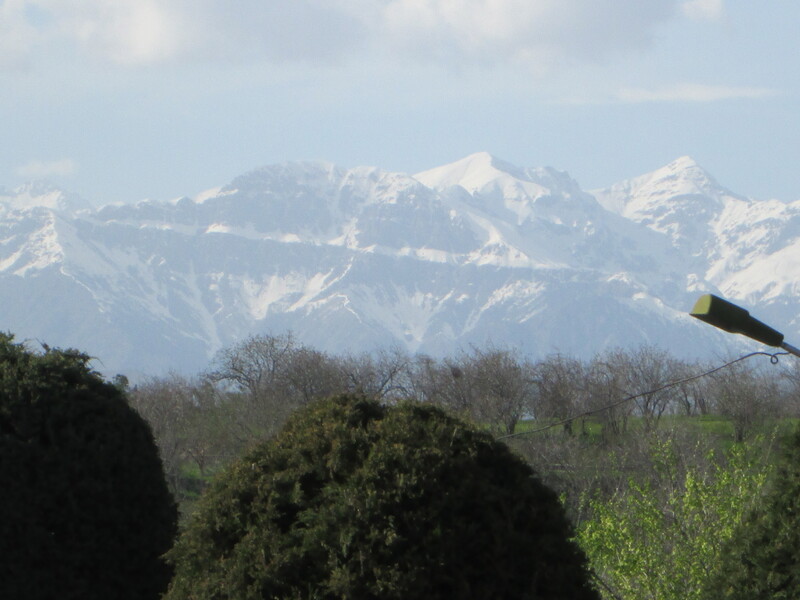 Dushanbe immediately struck me as a highly agreeable place – plenty of green space, tree-lined avenues, and spectacular views of the northern Fan Mountains in plain sight from the streets. After sleeping the rest of the morning, I visited the NPA office that afternoon, where I met my supervisor, Resad, a demining veteran and NPA’s new country director in Tajikistan. The NPA headquarters itself occupies a modest compound which was formerly the office of the Swedish embassy in downtown Dushanbe, well-furnished with new furniture and IT equipment. My own desk shares a second-floor office with the HR administrator. After meeting the rest of the headquarters staff I eased into my workspace, starting to review the operational procedures and monthly reports of the organization in an effort to get up to speed. The following day there was a farewell reception in the courtyard for Jonas, the outgoing director (who is moving to become the NPA regional director in Amman, Jordan). The reception provided a chance to meet many of the key mine action players in Tajikistan, including representatives from UNDP, the Tajikistan Mine Action Centre, the Tajikistan Campaign to Ban Landmines / Cluster Munitions, and staff from various embassies. Last week, I visited the site of NPA’s basic demining training course with Daler, the NPA operations manager, and Lars, a fellow intern from the Norwegian Embassy. 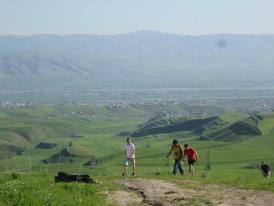 The training site is located just north of Dushanbe, near a Tajik military base. The road trip offered pleasant views of the nearby Fan Mountains and the steep rolling hills at the edge of the city. Reaching the site requires a four-wheel drive vehicle to navigate the rough path through the hills, but the trip is short; only 15 minutes or so from the NPA head office downtown. The training site is designed to replicate the conditions of a real demining operation; the entrance area is marked with a sign “control area” to mark the entrance to the simulated minefield. Everywhere that is safe to walk/drive over is demarcated with lines of plastic ribbon, including the parking/rest area where the team of medics are stationed (despite precautions, demining remains a risk-prone business, with several casualties among deminers recorded in Tajikistan in recent years). In this entrance area there are also demarcated paths leading to a rubbish pit and the latrines. There is also an area for testing the deminer’s equipment; one clear patch of ground (over which the sweeper should not detect anything), and one patch with pieces of metal (which, of course, the sweeper should be detecting). Every morning, before proceeding with demining activities, each team must test their equipment at this area. From the entrance zone there is a path leading to the base of a steep bank of a hillside. Across the slope for a distance of approximately 100m, teams of deminers inch their way up the simulated minefield. There are 68 trainees in the course, many of which are young and in only their second year of military service. They work in pairs, each taking 30 minute shifts working in a flash jacket and head-visor while their partner oversees their work. The process is slow, repetitive, and requires total concentration. They work up the hill in a 1m wide lane, clearing 20cm of land at a time. First a visual inspection, then a search for tripwires with hands and a metal wire, then clearance of any tall grass or weeds, then the actual metal detector sweep. The training course is overseen by Ramiz, the NPA technical advisor. He shows me that there are even real ‘remnants of war’ located on the hillside, including old ammunition shells from the time when the area was used as a firing range by the Tajik army. 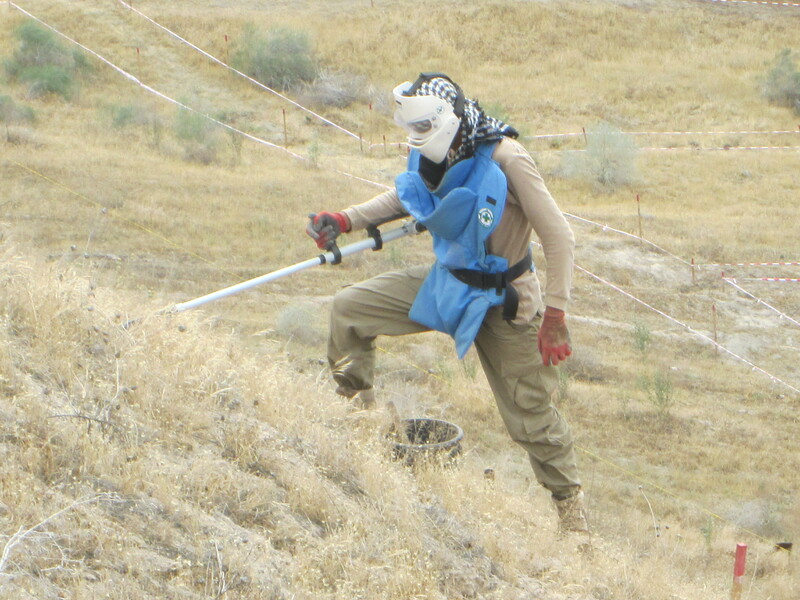 Ramiz estimates that over 90% of the trainees should pass the written and operational testing at the end of the course next week, after which time they will be ready for deployment to real demining operations along the Tajik-Afghan border. Getting briefed on humanitarian demining by the NPA Technical Advisor, Ramiz. At the basic demining training course with NPA Technical Advisor Ramiz and Operations Manager Daler. 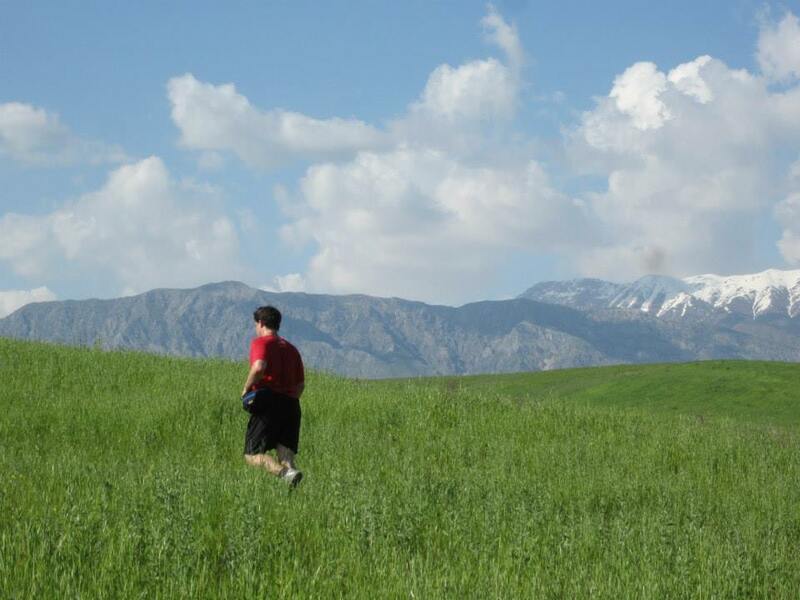 This upcoming week I’ll be travelling to the Rasht Valley in central Tajikistan to visit an ICBL training centre for landmine survivors. Stay tuned for more.